The famous 12727/28 Godavari Express, operated by South Central Railway (SCR) between Visakhapatnam and Hyderabad, completed 45 years of service on Friday. Former Director (Personnel) of Visakhapatnam Steel Plant, Y.R. Reddy, arranged for a small function with a select group of railway employees to celebrate the birthday of one of the most popular express trains on this route. 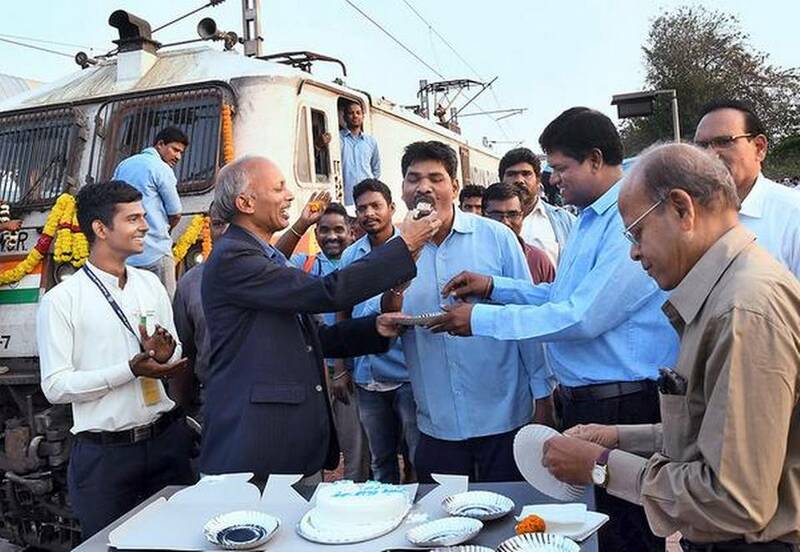 Mr. Reddy bought a small cake specially ordered for the occasion and cut it along with Loco Pilot G. Veerabhadra Rao, in the presence of Station Director Rajagopal, Station Superintendent Vara Kumar and a few other Railway officials. Railway workers washed the front of the locomotive and decorated it with flowers. This is the first time that I am involved in the birthday celebrations of a train in my 23 years of service. I have been piloting the Godavari Express for the last five years. The train is known for its punctuality and is the first choice of passengers,” Mr. Veerabhadra Rao said. The train was launched on this day back in 1974. I was pursuing my Masters in Human Resource Management (MHRM) from Andhra University and remember travelling by this train frequently to Hyderabad. I was inspired to celebrate the 45th year of its run after seeing two software professionals from Chennai – Arun Pandian and Mahesh – celebrating the 40th birthday of the 12635 Chennai-Egmore-Madurai Vaigai Express in 2016,” Mr. Reddy said. I celebrated the 25th birthday of 12711 Vijayawada–Chennai Pinakini Express last year. Godavari Express is the muddu bidda (beloved child) of Visakhapatnam, and people have a fascination for it in view of its punctuality and cleanliness, Mr. Reddy added. The Godavari Express is known for its punctuality and is one of the most preferred trains to travel to Hyderabad, said Chief Loco Inspector G. Murugan, who has been serving the Railways for the past 23 years.